Here’s some good news: from now on, we will automatically renew your material before it becomes due. Why are we doing this? Because the number one reason most people don’t use the Library is that the loan periods are too short (and difficult to keep track of). And because when life gets hectic—and when isn’t it?—the first thing we forget to do is to renew our library books, movies, and music. Items that have holds on them—when other patrons are waiting for them—will not be automatically renewed. For items that have holds, you will receive the standard email notice that the item is coming due. 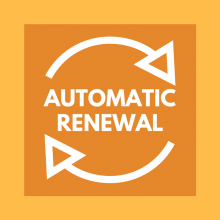 Automatic renewal is a one-time occurrence. You can’t renew the material again, unless you speak to a staff member. When an item that has been automatically renewed becomes due, you will receive the standard notice reminding you to return it. This only has an effect on material borrowed from the White Plains Public Library. Automatic renewal cannot be turned off, but you are certainly free to return items on the original due date! Notification is only through email, so be sure we have your current email address in our system. Questions? Contact Library Director Brian Kenney at bkenney@whiteplainslibrary.org. Automatic renewal is a great idea, thank you! It works well for books and CDs. However, for DVDs, renewing them 3 days early essentially cuts the usual time allowed for the checkout from 14 days to 11 days (assuming no one has a hold on it!). This can be problematic for people who are counting on having 2 weekends, or who can only come to the library on a certain day of the week. Can automatic renewal happen on the due date instead? Thank you! Hi Jaime, we are aware of this and while it cannot be changed right away, we hope that by September we will have it resolved so that you get the full 14 days.